The Technical Report describes the modeling of typical wall assemblies that have performed well historically in various climate zones. The WUFI (Wärme und Feuchte instationär) software (Version 5.3) model was used. A library of input data and results are provided. The provided information can be generalized for application to a broad population of houses, within the limits of existing experience. The WUFI software model was calibrated or "tuned" using wall assemblies with historically successful performance. The primary performance criteria or failure criteria establishing historic performance was moisture content of the exterior sheathing - More specifically, historic reports of decay, based on observation of large numbers of wall assemblies ("buildings") over a decade or longer. The primary "tuning" parameters (simulation inputs) were airflow and specifying appropriate material properties. "Rational" hygric loads were established based on experience – specifically rain wetting and interior moisture (RH levels). The "tuning" parameters were limited or bounded by published data or experience. The WUFI software model is a one-dimensional combined heat and moisture flow model. Typical building assemblies are multi-layer systems with complex three-dimensional airflow pathways. One-dimensional combined heat and moisture flow models have proven difficult to use for analysis in these types of assemblies due to the complexity added by the airflow and rain components. Rain is a significant moisture load: modeling the rain transport mechanism—a three dimensional phenomena in a multi-layer system—adds more complexity. The WUFI rain modeling inputs assumed a fraction (1%) of the incident water penetrating past the cladding, and a smaller fraction (0.01%) past the water control layer and into the sheathing. WUFI software is capable of modeling cladding ventilation, by introducing interior or exterior condition air into an airspace within the assembly. This allows for explicit (and correct) modeling of ventilated rainscreen behaviors. This airflow model within WUFI also allows the analysis of "through the assembly airflow" (i.e., air leakage through typical imperfect assemblies). This flow was approximated by adding air spaces between the insulation and sheathing, where interior and exterior-sourced air was introduced. Running the rainwater and airflow "tuned" WUFI software model generated the library of input data and results presented. The results agree with historical experience of these assemblies constructed in the climate zones modeled. The WUFI templates provided with this report supply useful information resources to new or less-experienced users. The files present various custom settings that will help avoid results that will require overly conservative enclosure assemblies. Overall, better material data, consistent initial assumptions, and consistent inputs among practitioners will improve the quality of WUFI modeling, and improve the level of sophistication in the field. Hygrothermal simulations such as WUFI (Künzel 2002) are coming into increasingly common use among building science researchers and practitioners, architects and designers, and energy analysts. Such simulations have been shown to be powerful and validated tools that predict hygrothermal behavior of enclosure assemblies. Simulation developers have continued to expand the capabilities of such tools over time. However, with increasing dissemination of these modeling tools – most notably WUFI - less experienced or less- informed practitioners have run models that provide unrealistic results—typically overly conservative. In some cases, these results clearly contradict extensive field experience and known history of assemblies, showing failure when they do not occur in reality. In other more worrisome cases, models run on assemblies that clearly have not performed historically show successful performance. This has resulted in confusion in the building industry— specifically, problems with advancing knowledge of moisture-safe building enclosure/shell assemblies. Development of moisture-safe enclosure assemblies is a component that will contribute to the Building America target of reducing residential carbon emissions 20% by 2020 and 80% by 2050. Develop guidance on design methods for enclosure design with a focus on abovegrade walls; guidance to be provided for both new construction and retrofits in all U.S. climate zones. 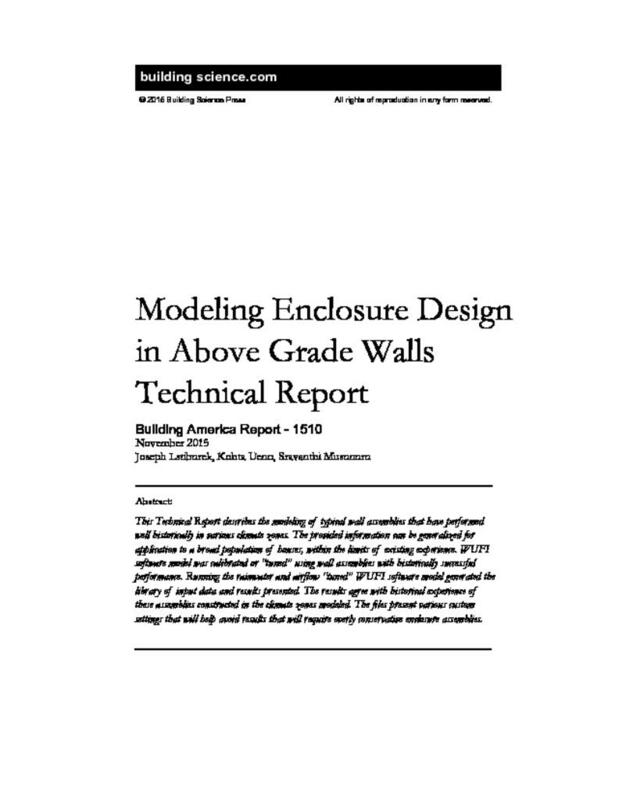 The Technical Report addresses this priority by modeling typical wall assemblies that have performed well historically, and demonstrating that these models agree with historic experience when modeled correctly. A library of input data and results are provided. Hygrothermal analysis is a relatively new field. The fundamentals date back to the 1950s. Analysis was observation and experience based. The major focus was rain and groundwater control. As insulation was introduced into assemblies, energy flows were altered, resulting in materials remaining wetter for longer periods of time. Simultaneously, new building materials were introduced that were inherently more water sensitive. The focus shifted from rain and groundwater to vapor movement in the form of air transport and molecular diffusion. Calculation methods of predicting performance and assessing risk were primitive and typically fundamentally flawed. Analysis remained rooted in observation and experience–i.e., a “build it, wet it, watch what happens” methodology. In the 1980s with the advent of numerical analysis and computer availability, it was believed that a shift from observation and experience to numerical methods based on physics was possible. Numerous models were developed but none with reasonable predictive capability. In the 1990s this changed based on work done in Canada (Kumaran, M., Mitalas, G. and Bomberg, M.; 1994) and Sweden (Viitanen, H., and A. Ritschkoff; 1991). These models were principally research tools rather than design tools. Work done in Germany in 2000 changed the modeling status quo (Künzel, H.; 2002). However, such design models were limited to mass assemblies typical to Europe. North American assemblies are hollow, multi layered, and dominated by three dimensional air flow networks that have proven problematic to modeling efforts. The dominant European model has proven to be attractive to North American practitioners. WUFI is popular despite its inability to provide reasonable predictive outcomes unless used by an experienced sophisticated user who already “knows” the correct outcome. In fact, despite the sophistication of the numerical analysis, available research is still dominated by experiment. We still must “build it, wet it and watch it.” Then, the observed outcomes are used to “tune” available models. The field remains phenomenologically based, as there is yet no widely accepted theory of combined heat and moisture flow. Given the Building America goals of reducing home energy use by 30%-50% (compared to 2009 energy codes for new homes and pre-retrofit energy use for existing homes), this research is an effort to reduce the first cost of wall assemblies. Many low-cost high-performance wall assemblies are not being used due to inappropriate failure criteria (ASHRAE Standard 160; ASHRAE 2009) linked with inappropriate hygrothermal modeling. This work also falls under the category of “2.0 Risk Reduction and Minimization,” from the document FY 2014 Residential Energy System Research Needs (NREL 2013). The goal of this research is to encourage the use of lower cost moisture safe assemblies that are known to work based on field experience and first principles, which are currently being avoided due to inappropriate failure criteria caused by inappropriate hygrothermal modeling. Higher cost moisture safe assemblies will be replaced with lower cost moisture safe assemblies. As the modeling becomes more predictive, a reduction in the reliance on field experimentation is likely to occur, reducing the time between innovation and deployment. Existing literature and engineering judgment based on experience provided the necessary information to calibrate the WUFI software models (ASHRAE Handbook of Fundamentals, ASHRAE 2013; Shi, X., Schumacher, C., Burnett, E., 2004; Straube, J.F., Burnett, E., VanStraaten, R., Schumacher, C., 2004; Straube, J.; J. Smegal, 2009). Similarly, existing literature and engineering judgment based on experience was used to analyze and report on the failure thresholds and criteria for above grade walls (Hutcheon & Handegord, 1983; Kumaran, M., Mitalas, G. and Bomberg, M. 1994; Straube, J. and Burnett, E.; 2005; Timusk, C., 2005; Viitanen, H., and A. Ritschkoff, 1991). The (a) calibration of the software models and (b) analysis of the failure thresholds/criteria was accomplished by first understanding above-grade walls with historically successful performance (Karagiozis, 2004; Künzel, H. 2002; Ojanen, T., Kohonen, R. and Kumaran, M., 1994). Walls with historically successful performance were identified by the participants of a Building America Expert Meeting (Ueno and Lstiburek 2014) and by Building Science Corporation dialog with the home building industry and code authorities. A round of WUFI files was generated based on these identified common wall assemblies. The behavior of these assemblies was examined, to determine appropriate failure criteria based on this historic record. The intent was to counter much of the common, existing modeling that shows that walls known to perform well (historically) do not meet various failure criteria (ASHRAE Standard 160, ASHRAE, 2009). Each of these wall assemblies is accompanied by a short case study, that explains the history of the wall, how it works (hygrothermally), the function of each component (air barrier vs. vapor retarder vs. water control), and the thought process behind the design. All simulations were run using WUFI (Wärme und Feuchte instationär) 1-D software, version 5.3. Simulations were run for a period of three years, in order to reduce the effect of initial conditions (moisture stored in building materials), and to show longer-term trends of moisture accumulation or drying. Round One is based on a 2x4 (R-13 fiberglass batt insulation) wall, with interior vapor control provided by an interior Kraft facer on the fiberglass batt insulation. Round Two substitutes 2x6 framing (R-19 fiberglass batt insulation) for the 2x4 framing of Round One. Round Three changes Round Two by replacing the Kraft facer with 6 mil polyethylene. Wall 2 (Vinyl Siding-Ply): changes Wall 1 by substituting vinyl siding for wood siding; highlighted in red in Table 1, Table 2, and Table 3. Wall 3 (Vinyl-OSB): changes Wall 2 by substituting OSB sheathing for plywood; highlighted in green in Table 1, Table 2, and Table 3. Wall 4 (Brick-OSB): changes Wall 3 by replacing vinyl siding with a drained and ventilated brick cladding; highlighted in blue in Table 1, Table 2, and Table 3. Wall 5 (Stucco-OSB): changes Wall 4 by replacing brick with hard-coat stucco, applied over two layers of #15 felt; highlighted in blue in Table 1, Table 2, and Table 3. Wall 6 (Vented Stucco-OSB): changes Wall 5 by replacing stucco with stucco applied over a spacer or “breather” mesh between two layers of #15 felt; highlighted in blue in Table 1, Table 2, and Table 3. The reasoning behind this spacer mesh in promoting ventilation drying is discussed by Lstiburek (2008). All walls use #15 asphalt saturated kraft paper (building paper) as a water control layer/drainage plane, fiberglass stud bay insulation, and interior gypsum board with latex paint. All simulations were performed in six climate zones (see 2.3 Climate Locations), resulting in 36 simulations (6 walls × 6 climates) per Round. The full listing of the wall assembly components are shown in Table 1 (Round One), Table 2 (Round Two) and Table 3 (Round Three) . . .